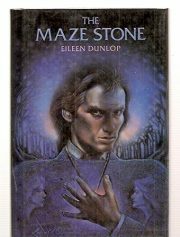 Eileen Dunlop’s 1982 The Maze Stone is a standalone juvenile fantasy. Fanny Mowbray’s reunion with her birth father Dr. Mowbray might have been cause for celebration, if the reason for the reunion had not been the sudden death of Fanny’s grandmother (the woman who had raised her). Fanny is too grief-stricken to have any energy, or will, to revive her ties with her father or build new ones with her stepmother Mrs. Mowbray or her stepsister Hester. An old mystery will bring the two teens together.